After cutting off talks with PM, Jewish Home MKs vent their fury at Likud for 'taking us for granted'; 'We're not in Likud's back pocket'. The Jewish Home party convened a stormy faction meeting Tuesday afternoon, following its dramatic decision to cut off coalition negotiations with Prime Minister Binyamin Netanyahu. Earlier Tuesday the party said it called off talks because Netanyahu has still not yet responded to Jewish Home Chairman Naftali Bennett's request to give him the Education Ministry, despite promising to do so within 48 hours when the two met Saturday evening. According to sources present at Tuesday afternoon's faction meeting, party head Naftali Bennett began by opening the floor to MKs to air their views on the stuttering coalition talks. MKs took the opportunity to lament the fact that Netanyahu's Likud party was attempting to deny Jewish Home's key demands, but also said Jewish Home itself had not been clear enough about what its red lines were during the negotiations - and called on the party to clarify those red lines immediately. Party officials were particularly annoyed that Netanyahu has still not given any answer regarding Jewish Home's key demands for more Jewish construction in Jerusalem. But MKs also challenged that Bennett's request for the Education Ministry is aiming too low, noting that Moshe Kahlon's Kulanu party - which received just two more seats (10) - has reportedly received a far better deal from Netanyahu. They also lamented that the haredi parties Shas and UTJ - which received 7 and 6 seats respectively, to Jewish Home's 8 - have also fared far better in coalition negotiations. It will be recalled that Bennett asked for the Education Ministry after a long and stormy impasse, after Netanyahu broke a pre-election promise to grant him either the Defense or Foreign Ministry portfolios. Although many within the Jewish Home's rank-and-file religious-Zionist support base were keen on the party receiving the Education Ministry, it is a far less senior position - making Netanyahu's hesitance to give even that to the party all the more humiliating. Some Jewish Home officials have suggested that Netanyahu's stubbornness in talks with them - despite Bennett's flexibility - may be the result of pressure from the US administration not to form a right-wing government of 67 MKs, but a "broader" one which would include the left-wing "Zionist Union" joint list of Labor and Hatnua. MKs demanded Bennett draw clear red lines regarding Jewish Home's portfolio demands as well. Currently, it is predicted that as well as the the Education Ministry, Jewish Home will also receive the Agriculture Ministry and the Culture and Sports Ministry - slated for MKs Uri Ariel and Ayelet Shaked respectively. As part of the deal, the Agriculture Ministry will also be assigned the government's Settlement Agency, which covers housing plans and permits in Judea and Samaria. But at the faction meeting party officials called on Bennett to demand Netanyahu further bolster the Agriculture Ministry by include responsibility for development in the Negev and Galilee regions as well, and that he guarantee responsibility over the Batei Din (religious courts) will remain with the Religious Affairs Ministry and not be transferred to the Justice Ministry. 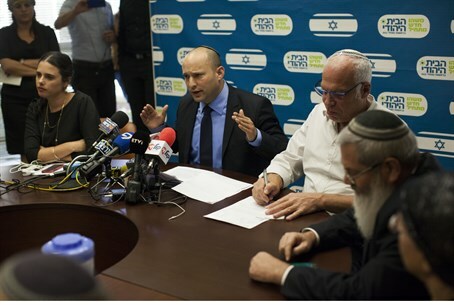 Bennett has been under pressure to demand MK Rabbi Eli Ben-Dahan retain the Religious Affairs Ministry as well. MKs also said Bennett should reiterate threats to walk out of talks altogether and join the opposition - and that the party should be prepared to do so in practice if need be. "'The Opposition' is not a bad word," a senior party source told Arutz Sheva. "The Likud is taking us for granted. We are not in the Likud's pocket." "We have become the Likud's whipping boy," another party source lamented. One senior party MK even made an unusual suggestion during the meeting, calling on fellow legislators not to remain "fixed" on a government led by Likud, but to even be willing to turn to the head of the Opposition, Labor leader Yitzhak Herzog, should Netanyahu continue to rebuff their demands. It is not clear whether that was meant as a serious move in practice - highly doubtful given the ideological chasm between Jewish Home and Labor - or, as is more likely, as a negotiation ploy to turn up the pressure on Netanyahu as he nears his legal limit for stretching out coalition talks. The meeting ended with a party statement declaring that the Jewish Home would not return to coalition negotiations until it receives answers regarding its demands for laws curbing Supreme Court activism, construction in Jerusalem, and the portfolios that the party will receive.